This self-guided, ten-night cycling holiday explores Italy's beautiful, sun-drenched Puglia region with its vibrant fishing villages, sandy beaches and beautiful, rolling hills, all above the mesmerising blue of the Adriatic Sea. Puglia offers a wonderful contrast of landscapes, from the fertile farming hamlets, vineyards and orchards of its interior to its dramatic, rocky coastline. Your holiday begins in the picturesque coastal town of Monopoli, from where you follow the coast north, passing white sandy beaches and secluded coves with wonderful opportunities for seafood lunches along the way. Head inland and you'll be blown away by a rich landscape of vineyards, olive groves, fruit orchards and fields of tomatoes and peppers alive with colour. Marvel at the UNESCO World Heritage Site of Alberobello with its unique trulli houses - emblematic of the region - and the glistening, whitewashed village of Ostuni. After a transfer to Acaya you'll discover the delights of the stunning Salento coast, taking in Puglia's easternmost and southernmost point - an amazing sight - and the Baroque masterpiece that is Lecce, renowned for its stunning C18 architecture and known as the 'Florence of the South'. 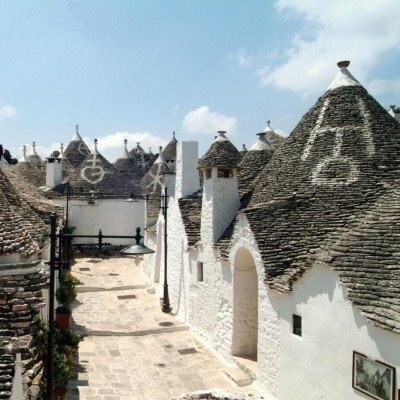 You'll stay in an excellent variety of accommodation on this holiday, including four **** or ***** hotels and an authentic trullo house in Alberobello! In Conversano your elegant boutique hotel is just a short walk from the mediaeval streets and Romanesque cathedral of this historic town; in Otranto your base is a stylish hotel boasting stunning views over the old town and harbour from roof sun terrace ; while in Lecce you stay in the heart of the beautiful old town in sumptuous ***** hotel, close to the Roman amphitheatre and Baroque palazzi, with the hotel's roof garden offering one of the best views there is over the city. Arrive at your hotel in Monopoli. After a welcome briefing there's time to discover the town before dinner. Today you follow a beautiful coastal route from Monopoli towards the sleepy, inland town of Conversano. On the way you'll have chance to visit the charming, colourful fishing village of Polignano a Mare which is beautifully located, clinging to the limestone cliffs. It's then onward through the pretty village of San Vito, with its tiny harbour full of multi-coloured boats, before arriving in Conversano. Today you'll cycle through the Valle d'Itria, a valley of rolling hills and wooded slopes where the beautiful scent of wild mint and herbs fills the air. Take a break in the small towns of Putignano and Noci, with their typical whitewashed houses and narrow alleyways. It's then off to UNESCO-recognised Alberobello, filled with the quirky Trulli houses . Take some time to explore the narrow streets of historic Alberobello. Browse the quirky souvenir shops or sample the local cuisine in one of the bars or restaurants; perhaps learn about the town's history at the Museo del Territorio. If you fancy cycling, a circular route (45km/28.5mi - route notes provided) takes you into the heart of the Itria Valley and spectacular Locorotondo, with its 360 degree views of the valley. The town of Martina Franca lies a little further ahead - continue on to discover its stunning Baroque architecture and palazzi. This morning you'll follow winding country lanes before a long downhill stretch takes you towards Capitolo (enjoy panoramic views of the Adriatic coastline on the way), ending in a beautiful collection of almond and olive orchards, vineyards and vividly coloured fields full of peppers and tomatoes. The choice is yours today. You could head to the local beach or simply spend time unwinding by the hotel pool. If you fancy something a bit more challenging, we provide route notes for a circular cycle ride (48km/30mi) which takes you to Ostuni with its dazzling whitewashed houses sitting beautifully above olive groves and vineyards. Follow an easy route to the Adriatic coast, passing the vibrant fishing village of Savelletri, a perfect stop for a tasty lunch or traditional Italian coffee. You'll cycle past the archaeological ruins of Egnazia, the site of a Greco-Roman town which dates back to 4BC, before reaching the pretty seaside town of Monopolil. Tonight you can choose from a wonderful selection of restaurants in the old town. We transfer you and your bike to Acaya, from where you'll cycle along the stunning Salento coast to Otranto, taking in ancient olive groves and fishing villages en route. You stay at the 4 star Corte di Nettuno by the harbour in Otranto, close to the old town where there are numerous options for dinner. A free day in Otranto today, or an optional challenging day's cycling (55km/34.5mi) which takes you up and down along the coast south and west of Otranto, where you'll see the easternmost and southernmost point of Puglia - a spectacular sight! 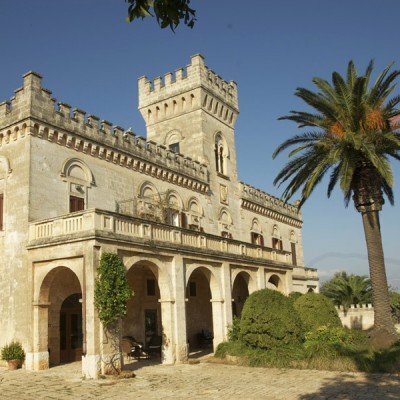 You can also visit the Castel di Salve winery on your way to Santa Maria di Leuca, which is known as De Finibus Terrae, 'the end of the earth', before taking a shuttle back to the hotel. Today you head to Lecce on mostly flat terrain amidst endless olive orchards and menhirs. 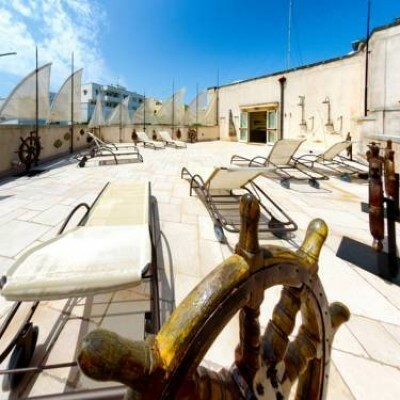 Tonight you'll stay at the stylish Risorgimento Resort (5*) , just a few steps from some of Lecce's Baroque masterpieces. Please note: This tour has been given a 1 Bike + rating based on ascents/descents and distance; the cycling may feel harder over the hotter months. This property is 3 minutes walk from the beach. 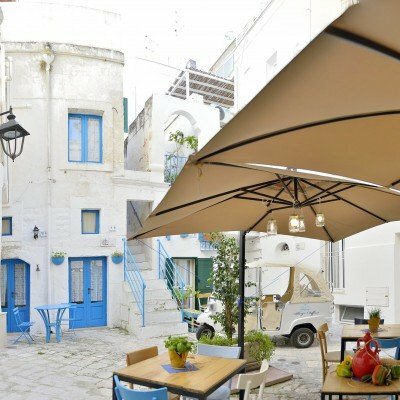 Set in various locations around the historical centre, just a stroll from Monopoli's seafront and its beautiful beaches, Albergo Diffuso Monopoli offers elegant rooms, all air-conditioned rooms either have a terrace or balcony. 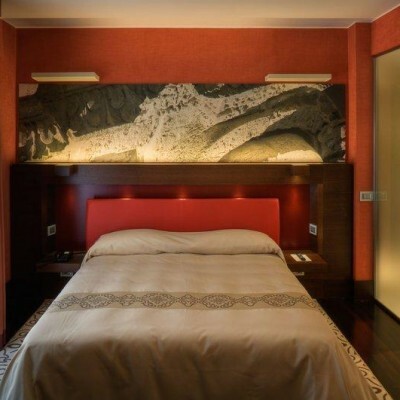 Accommodation has exposed Tuffo-stone walls and quality furniture. There is free WiFi, flat screen TV, air conditioning and a private bathroom with bath or shower. Breakfast in the hotel's central cafe and dinner will be in a good local restaurant. The 4-star hotel Corte Altavilla Relais & Charme is located right in the historic centre of Conversano, just off one of the main squares - Piazza Conciliazione. 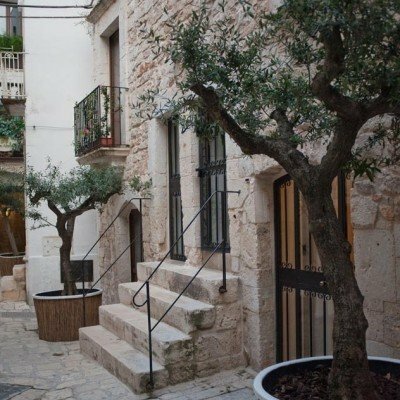 The hotel is in an old medieval building with inner courtyard that once served as an old medieval courthouse for the town. Following major renovation works in 2002 the hotel opened as an elegant four-star boutique hotel with 32 elegant rooms and appartments, each with its own personality and charm, with white stone walls, wrought iron furnishings, wooden-beams and vaulted ceilings. All rooms are equipped with modern amenities including: air-conditioning, satellite-TV, direct-dial telephone, safe, Internet and mini-bar/fridge. Room upgrades: Junior Suite . The Junior Suite has charming furniture with a living room and panoramic view. A unique and authentic experience staying in a trulli, a traditional 15th Century Apulian stone building with conical roof. Each trulli house is made up of a double bedroom, small bathroom with shower and living area with sofa and small kitchenette. The trullis are located in the centre of historic Alberobello, a UNESCO world heritage site, within walking distance of cafes, restaurants and shops. Masseria Salamina is a large 17C fortified farmhouse, set in 173 acres of rich agricultural farmland. The property is surrounded by orchards of secular olive trees that are up to 400 years old, used in the production of their own high quality, extra virgin, olive oil. Inside the masseria, there's a large and welcoming restaurant where you can taste specialities of sumptuous Southern Italian cuisine, served in the suggestive atmosphere of the open-air courtyard. The rooms here are simple yet comfortable and with all the necessary amenities and have been created out of the conversion of the masseria's outbuildings. The common areas comprise of the meeting hall, bar, lounge & TV room and the outdoor swimming pool with views reaching across to the sea. Room upgrades: Farmhouse Suite, Double Room Superior, Junior Suite or Junior Suite Deluxe . The farm House suites are spacious and comfortable, pproximately 50m2, composed of a double room, living room with single bed, wide bathroom with bathtub, and a kitchen. They are located in the south-east wing, of more recent construction but always adjacent to the Masseria, all with a wonderful view and with their own outdoor space. The Superior Room is in the Manor wing of the Masseria, on the 1st floor, the owner's house since the 17C, it has valuable antique furniture, with marble bathroom, it has a hall and an indoor balcony with view. The Junior Suite is in the Manor wing of the Masseria, on the 1st floor, the owner's house since the 17C, it has valuable antique furniture, with marble bathroom and Jacuzzi. Deluxe Junior Suite is in the Manor wing of the Masseria, on the 1st floor, the owner's house since the 17C, it has valuable antique furniture, with marble bathroom, it has a hall and a private balcony with view. The Superior Suite is in the Manor wing of the Masseria, on the 1st floor, the owner's house since the 17C, it has valuable antique furniture, a living room with fireplace and balcony, and marble bathroom with Jacuzzi and showerbox. This property is 10 minutes walk from the beach. Once a farmhouse, Corte di Nettuno now offers modern rooms and 2 rooftop terraces overlooking the harbour. Throughout the hotel, you will find a unique marine design with sea-themed mosaics, shipping maps, and other nautical objects as decor. Your room features a flat-screen TV, air conditioning, and free internet access. The restaurant at Hotel Corte Di Nettuno is a great place to sample dishes and wines from the Puglia region. It offers a large buffet breakfast, and all meals can be enjoyed out in the large courtyard. Alternatively you can walk into the centre of town (10 min ) and try one of the cheap local fish restaurants. Featuring a roof-top restaurant with panoramic views, the Risorgimento Resort is located in Lecce's Baroque historic centre. It offers free WiFi throughout, large modern rooms, and a relaxing spa. Rooms are air conditioned and come with a minibar and satellite TV. Each has a marble bathroom with bathrobes and slippers. The attentive staff provide a continental buffet breakfast. The 3 restaurants offer both Salento flavours and classic Italian cooking. Alternatively there are plenty of good restaurants nearby. Drinks and snacks are available all day at the Janet Ross Bar. The health club offers a Turkish bath and multisensory shower. Massage and beauty treatments are also available.The hotel doesn't have a pool but there's everything else! Its even got it's own golf course (3km away)! Piazza Sant'Oronzo is just 100 yards from Risorgimento Resort . The Cathedral is a 5-minute walk away. Room upgrades: Deluxe Double, Executive, Junior Suite or Garden Suite. Transfers included from Bari airport at 14:45, and back to Brindisi airport at 09:30. This holiday is unsuitable for children. Self-guided cycling Managed locally by Headwater appointed agent. selected Mons, Weds & Sats from 29th Apr 2019 to 26th Oct 2019, for 10 nights. All dates are subject to availability, please contact us to check. It is possible to hire tandem bikes for this holiday at a supplement of £305 per bike. As these are available on a first come first served basis, we recommend early booking to avoid disappointment. Airport transfers are subject to at least 2 people (in total) booked on each departure.